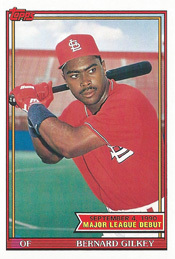 As a Cardinals rookie who had been in the major leagues for less than a month, Bernard Gilkey prevented perfection by delivering a nearly flawless performance of his own against the Phillies. On Sept. 25, 1990, at Philadelphia, Gilkey led the Cardinals to an unlikely 1-0 triumph. Playing on the day after his 24th birthday, Gilkey tripled to lead off the first inning and doubled with two outs in the ninth. In between those two hits, Phillies starter Terry Mulholland retired 26 Cardinals in a row. “That was as close to being perfect as anyone can be without being perfect,” Phillies manager Nick Leyva said to Calkins Newspapers. Gilkey, a St. Louis native, had made his big-league debut with the Cardinals on Sept. 4, 1990, in his hometown against the Mets. With Class AAA Louisville in 1990, Gilkey had hit .295 with 147 hits in 132 games and 45 stolen bases. He struggled early after his call-up to the Cardinals, hitting .212 entering the game against Mulholland and the Phillies. Playing left field and batting in the leadoff spot, Gilkey opened the game by drilling a 2-and-2 pitch from Mulholland toward the right side of the second base bag. The second baseman, Randy Ready, dived to his right. “The second baseman came within a whisker of catching the ball,” Torre told the Post-Dispatch. The ball eluded Ready, skidding across the artificial turf and into the outfield. Center fielder Sil Campusano had shaded Gilkey to hit toward left field. The ball took a path into the gap between Campusano and right fielder Dale Murphy, rolling to the wall. Gilkey raced to third with a triple. “If (Gilkey) hits the ball two inches the other way, Randy Ready probably gets it,” Leyva said to the Philadelphia Daily News. The next batter, Geronimo Pena, lifted a sacrifice fly to center, scoring Gilkey. After stinging the Phillies with his speed and hitting, Gilkey hurt them with his throwing. In the bottom half of the first, Campusano was on second base when Murphy hit a single to left field. Gilkey fielded the ball and fired a strike to catcher Ray Stephens, whose sweep tag nailed Campusano before he could reach home plate. Relying on a mix of sliders, sinkers and fastballs, Mulholland retired the Cardinals in order until Gilkey hit a double to right-center with two outs in the ninth. “We only hit two balls hard,” said Torre. The Phillies, though, couldn’t produce a run off starter Joe Magrane and relievers Mike Perez and Ken Dayley. Magrane scattered eight hits over seven innings before he tired. “Mulholland was cruising along so easily I didn’t have a chance to even get a drink of water,” Magrane said to the Post-Dispatch. Perez and Dayley each worked an inning and each yielded a hit. The Phillies had 10 hits and two walks, but stranded 11 base runners. Several Phillies said Mulholland pitched better that night against the Cardinals than he had a month earlier, on Aug. 15, 1990, when he had a no-hitter versus the Giants.